2mm Old suede leather hat. 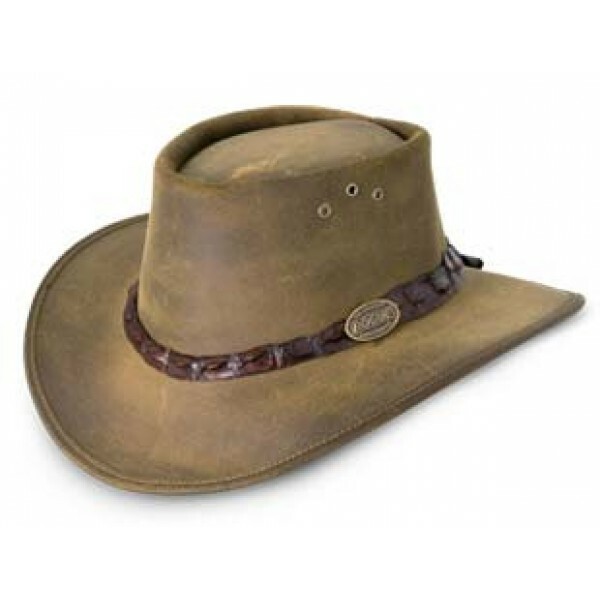 Broad brim with Crocodile leather hat-band. ROGUE full leather or canvas hats have a brim size of between 60 - 80mm and deliver excellent Ultraviolet Protection, a UPF 50+ or 97% block-out of harmful UVA/UVB radiation. Selke Leathercraft is producing an exciting range of ROGUE products in leather and canvas, aimed at meeting the growing demand from our customers for quality and good value. Our goods are very proudly Southern African made in our two factories in Hazyview, South Africa and Mozambique and the increased demand for our products locally and internationally has underlined the legacy of the brand. Selke Leathercraft is highly focused on being innovative and progressive in new product design. Their recent developments include the Pack-A-Way range of folding hats, their Big 5 Collection of game leather articles and their most recent development - Tin Cloth - offers an exciting and unique addition to the range of products. The most genuine of leathers, as it retains all the natural markings and texture of the original hide, with the minimum treatment. Rogue 2mm fullgrains are dyed to colour and treated with a blend of oils and waxes to give a supple yet durable end product, becoming softer and more attractive with wear and age. 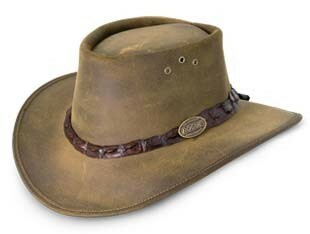 An exclusive range of headwear in Genuine Buffalo or with Genuine Crocodile hatbands. All the leather used in the manufacturing of Rogue hats and bags is sourced from commercial farms or other legal entities from within southern Africa. Rogue supports ethical wildlife management. The Rogue Suede hats are crafted from superior grade 2mm suede leather and are available in three brim sizes and a variety of colours - Khaki, Stone, Choc and Old Suede. A softer leather with a more ‘rugged’ bush look, suede has it’s own distinct appearance and attraction. A popular option in warmer climates, made with Cotton Mesh crowns across the full range - Fullgrain, Suede and Canvas. Better and more effective than eyelets, the mesh gives all-round air flow for a ‘cool’ head on a hot day. The Breezy comes standard with a forehead protector. The mesh used in the BREEZY range constitutes more than 3% of the component quantity therefore we are unable to claim a UPF 50+ factor. However, the hat is cooler and the broad brim does protect the eyes, nose and ears to the same level as the others. Lighter in weight and more affordable than leather, the Canvas hats are made from 100% cotton in a 510g weight. Soil and Water resistant, the hats are available in 4 colours - Sand, Olive, Natural and Camo. The new addition "Packer" has a smaller brim with fullgrain leather trim and large mesh eyelets. Back in the 1800’s, loggers, miners and outdoorsmen around the world relied on the strength and durability of waxed canvas to protect them from the elements. In logger’s slang, "Tin Cloth" referred to the stiffness, water resistance and strength of the cloth they made. And so it was born - Tin Cloth, - made from 100% Cotton Canvas in a 510g weight and impregnated with a blend of natural oils and waxes. In a world of synthetics and cheap trash, why not re-create a Legend? Tin Cloth is a unique fabric that improves with wear and age. The Pack-A-Way is a quality Rogue design that simply folds up into a bag in 3 easy steps. Available in a fullgrain leather (1.4mm), oily suede or with a Breezy crown. Pack-A-Way hats are ideal for easy travel packing and storage.